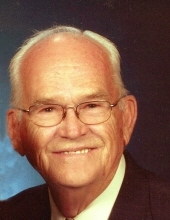 Orville Curtis Carlson, 85, died April 14, 2019 in Story City, Iowa. His funeral will be Thursday, April 18th at 11 a.m. held at St. Petri Lutheran Church in Story City. Visitation will be held Wednesday, April 17th between 5-7 p.m. Internment will be at the South Marion Cemetery near Stratford. Orville was born August 11, 1933 at the Webster City Hospital to parents Archie and Violet (Neese) Carlson. Orville grew up on the family farm northwest of Stanhope. He graduated from Stanhope High School in the spring 1951. After high school he attended linotype school and worked for a year before being drafted into the Army in 1953. He served in Korea as the Radar O’Reilly (clerk) of his company. Upon his return from Korea he farmed with his father and brothers. Orville met the love of his life Alma Stolee, and they were married on February 17, 1956 in Garden City, Iowa. To this union four children were born, Kurtis, Rodney, Michelle and Janelle. Orville farmed the home farm for almost 50 years. He was also employed as a State of Iowa Meat Inspector followed by service as a Federal Meat Inspector in several locations. He retired in 1996. Orville and Alma moved off the farm to Ogden in 1991 and enjoyed many years there following the Bulldog sports teams and taking part in church activities. In 2003 they moved to Story City to be closer to family. While living in Story City they joined St. Petri Lutheran Church and especially enjoyed coffee with friends and family at McDonalds. Orville spent time with his longtime friends golfing and enjoying each other’s company. Orville is survived by his son Kurtis (Denise), Daughters Michelle (Stewart) Dunham, Janelle (Joe) Hoffman, grandchildren Grant (Sarah) Carlson, Valerie (Adam) Hubert, Brittany Dunham, Neko (Santanya) Dunham, Amber Dunham, Ryan (Rachel) Hoffman, Paige Hoffman, Carrie Hoffman and 5 great grandchildren. He was preceded in death by his wife, Alma, son, Rodney, parents, Archie and Violet, and brothers, Robert, Loran and Bernard. Memorial contributions may be directed to the Parkinson’s Disease Foundation or St. Petri Lutheran Church. To send flowers or a remembrance gift to the family of Orville Curtis Carlson, please visit our Tribute Store. "Email Address" would like to share the life celebration of Orville Curtis Carlson. Click on the "link" to go to share a favorite memory or leave a condolence message for the family.